I, Lloyd C. Engelbrecht (born 1927), am Professor Emeritus of Art History at the University of Cincinnati. I retired in 2001, and, because of improvements in human longevity, I am part of the largest community of emeritus scholars that has ever existed. A major part of my research was conducted jointly with my late wife, the art historian and photographer June-Marie Fink Engelbrecht (1930-2009). This research concerns the architect and designer Henry Charles Trost (1860-1933) and his family firm of Trost & Trost. The two principal results of our collaboration were an award-winning biography, Henry C. Trost: Architect of the Southwest (El Paso: El Paso Public Library Association, 1981), and a complete catalogue raisonné of the work of Henry Trost and his family firm of Trost & Trost. The creation of the catalogue raisonné was subsidized by a major grant from the National Endowment for the Humanities. Under the terms of the grant, paper copies of each item in the catalogue raisonné were placed in the El Paso Public Library in the late 1980s. More recently the architect’s grandniece, Margaret Smith of Phoenix, has placed the catalogue raisonné on a web site that she has set up, www.henrytrost.com. 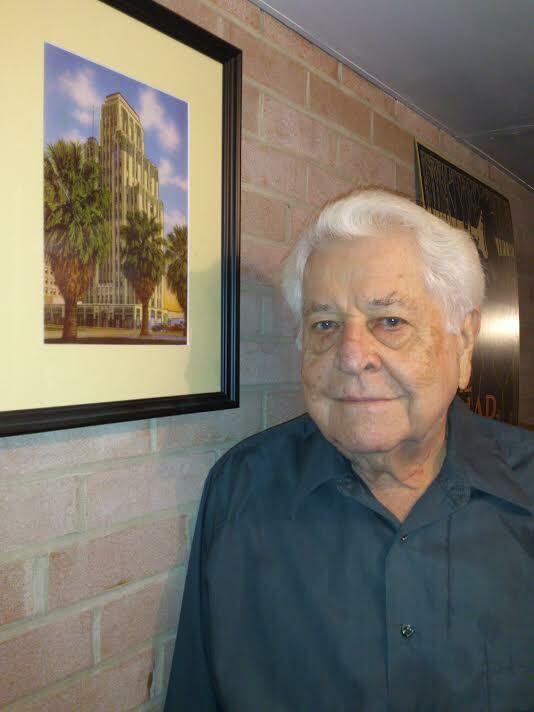 The framed picture I am posing with illustrates Trost’s Luhrs Tower of 1930 in Phoenix, scanned from the postcard shown. The picture on the right exemplifies a major advantage of Scholar@UC. Anyone now has access to it on the internet, but it is a mystery building built by the firm of Trost & Trost. Possibly no longer extant, it probably dates from about 1917, and was likely located in Arizona or the Mexican state of Sonora. June and I were not able to find out anything about it, but now that it can be seen online, if anyone recognizes it he or she can contact me or Margaret Smith. Recently all of the Trost documents and images that June and I had accumulated in our research were donated to the C. L. Sonnichsen Special Collections Department of the Library of the University of Texas at El Paso. A major focus of my research involves the history of design. The most notable achievement of that part of my research is the first comprehensive, fully-documented biography of László Moholy-Nagy (1895-1946): Moholy-Nagy: Mentor to Modernism (Cincinnati: Flying Trapeze Press, 2009). But, as important as Moholy is to design (through his own work for clients in Germany, Holland, France, the U.K. and the U. S.A., and through his writings about design and his key role in the development of design education in Weimar Germany and in Chicago), he was probably the most well-rounded creative figure in the twentieth century. Thus, in addition to his work in design, as I discuss in detail in my two-volume biography, he worked on the cutting edge as painter, sculptor, printmaker, photographer, film-maker and music theorist, and in his youth published poems and short stories. Although June was not part of a joint byline in Moholy-Nagy: Mentor to Modernism, she was nevertheless of enormous assistance to my efforts. For more on my Moholy biography see my publisher’s website, www.flyingtrapezepress.com. Currently I am working on a biography of Chicago’s first Modernist painter, Rudolph Weisenborn (1881-1974), who, despite his major artistic achievements and his role in the history and art history of Chicago, has been mysteriously erased from the collective memory of the residents of the Windy City. Again, see my publisher’s web site, www.flyingtrapezepress.com. As an octogenarian, I am pleased that I have already been able to make two items of my unpublished research available on Scholar@UC, because it may not have been possible, during whatever time is still available to me, to arrange for publication on paper, and I am convinced that there are readers who will benefit from each of them. Some of these readers might even have missed the appearance of them on paper, were that to have taken place. Also, it is gratifying to know that whatever I put on Scholars@UC that might useful for secondary or university-level classes is available at no cost to faculty or students. Scholar@UC preserves the scholarly output of the University of Cincinnati. Use Scholar@UC to preserve your work and increase its accessibility to a global audience. To get started with Scholar@UC, visit scholar.uc.edu or email scholar@uc.edu.